With the beginning of fall and cooler temperatures, we begin to look forward to warming comfort foods. This tempeh stew tasted very good o a rainy day. Place in a large pot of lightly salted water and bring to a gentle boil. Cook until the potatoes are soft. In a large pot, combine vegetables and 1 tablespoon oil. Saute the vegetables for 3-5 minutes. Add the 1/2 cup water, over medium heat, bring to a soft boil, then turn down the heat and place a lid on the pot. Add the seared tempeh and vegan Worcestershire sauce or tamari to the vegetables. Cook, covered, for 5 minutes or until vegetables are tender. Peel and mince the garlic. Add garlic and 2 tablespoons of olive oil into a small frying pan and cook until softened. Drain the water from the cooked potatoes. Add the garlic, salt and pepper to the potatoes and mash. 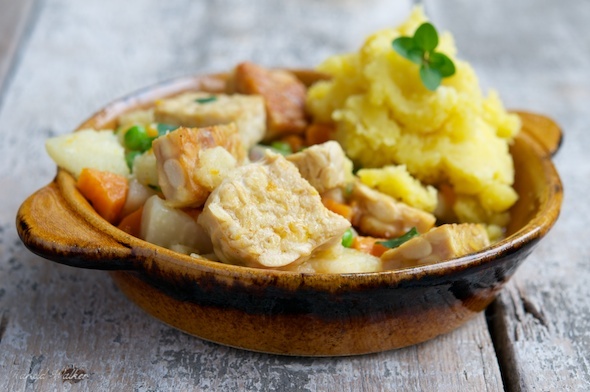 Divide potatoes among four dishes and top with stew. 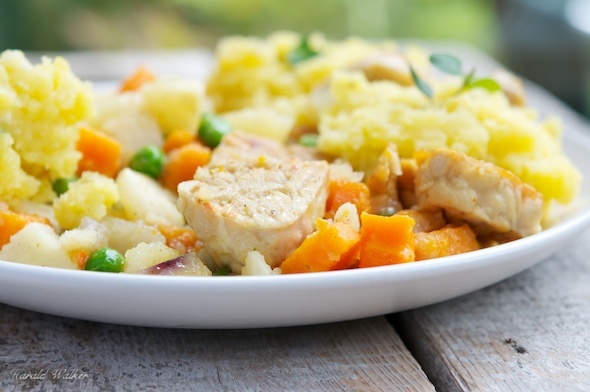 Posted by Chris Walker on October 12, 2012 in Carrot, Meals, Potato, Stew, Tempeh.